Vous le recevrez chez vous sous quelques jours. Les frais de port sont offerts pour la France métropolitaine. Édité dans la collection "Voir naître le talent" aux éditions KnowWare, le beau livre "Rêvalités" rassemble soixante-trois photographies réalisées au cours des quatre dernières années par Julie de Waroquier, accompagnés de textes écrits par l'auteur. Plus d'informations : CLIQUEZ ICI pour accéder à l'espace Beaux livres sur le site de Compétence Photo. You will receive it within a few days. 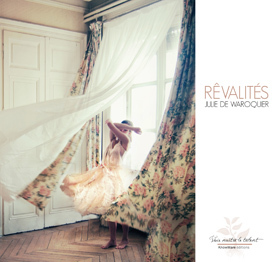 Published by KnowWare editions in the “Voir naître le talent” series, the photography book “Dreamalities” is composed of sixty-three photographs that were created during the past four years by Julie de Waroquier, and of texts written by the author. Between dreams and rivalries, Julie de Waroquier creates pictures which look like they escaped from imagination, and which disturb the categories of the material world. The better to get back to our world however, with our eyes fed by unusual yet familiar visions. Thus she strives to explore the poetic value of the unconscious: each picture is to be seen as the rapture of a dream that would come true and that would be caught by the camera. She questions the world by showing what our society denies, everything that belongs to fiction, poetry and dreams, and that is part and parcel of our reality. With her pictures, she shows the limits of the post-modern pessimism, reminding us the value and the depth of the human being. That is why, through symbolism, she explores the invisible world which resides inside human minds and hearts. Fears, desires, and passions. Her approach is simply poetic; it raises questions about the world and the man who inhabits it: she’s looking for Meaning where our society wants us to see nonsense or vacuum. Il n'y a pas actuellement d'autres informations disponibles sur le contenu de ce manuel.